Adults are not the only ones who require general dental care, or an occasional restorative treatment when an issue arises. Children should also visit their dentists regularly for routine checkups and cleanings, or to seek early treatment for a cavity or other issues, if present. For children, regularly scheduled visits allow us to ensure that their teeth, gums, and oral structures are developing correctly, hopefully avoiding the need for more extensive treatment in the future. 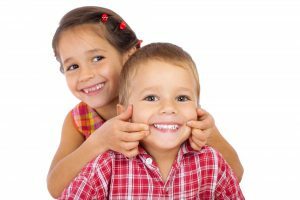 Cavities are the most common affliction to children’s dental health; therefore, much of children’s dentistry involves helping kids prevent the formation of tooth decay (which causes cavities). Besides helping you teach your children to brush and floss properly and regularly, we can also boost their cavity prevention through dental sealants and fluoride treatments. Fluoride is a mineral that interacts with the outer layers of your teeth, called enamel. Fluoride bonds with the minerals that comprise tooth enamel, strengthening the protective layer against cavity-causing plaque and bacteria. For additional protection, dental sealants (thin layers of biocompatible acrylic) can be applied to the chewing surfaces of your child’s back teeth. The sealants act as additional barriers between teeth and harmful plaque, and make it harder for bacteria and food debris to collect in the tooth’s nooks and crevices. If it’s time for your child to visit the dentist, then schedule an appointment as soon as possible with one of our dentists. Call Cedar Dental in Cedar Rapids, IA, today at (319) 364-7108. We also welcome patients who live in Mount Vernon, Iowa City, Hiawatha, and all nearby communities.